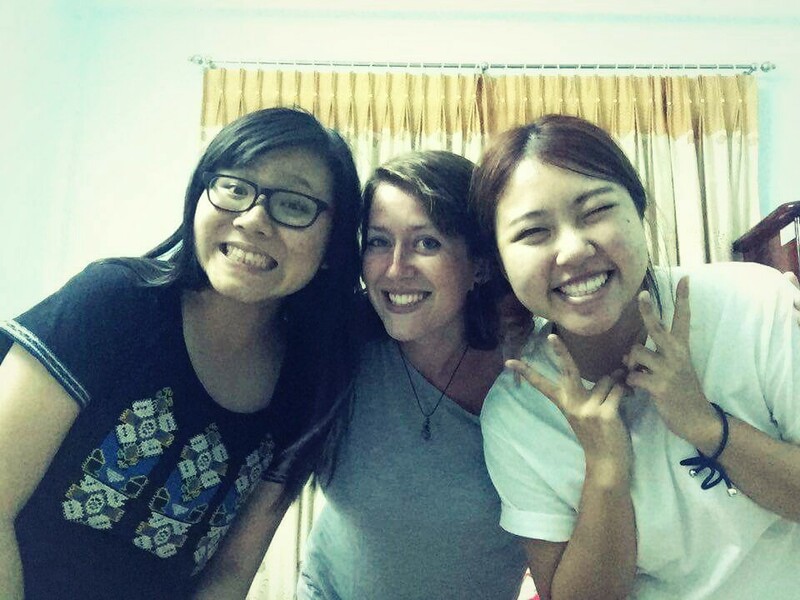 I spent 2 nights in Hué after leaving Da Nang...didn't love it there, but on the plus side, I made friends with two really hilarious girls from Hong Kong, and we had a lot of fun together! After the shenanigans in Hué, I caught a bus packed to bursting with young backpackers to the now-famous village of Phong Nha, on the outskirts of the National Park. The main draw there is the numerous amazing caves in the area, including Son Doong,the newly-discovered largest cave in the world! 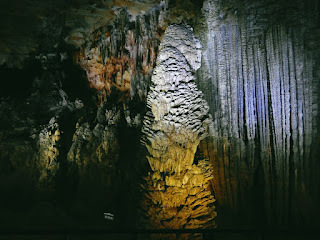 Since I don't have $3,000 to spare for that, I decided to take a much smaller tour to see 2 other popular caves: Paradise Cave, and the Dark Cave. It was a lot pricier than I cared to pay, but figured it was my only chance to see these places, and they were highly recommended by other travelers. Lucky for me, in the evening I ran into a guy I had previously met in Saigon, and he had his own motorbike...and he invited me to come along on his self-guided tour the next morning! It took less than .5 seconds for me to agree to this. 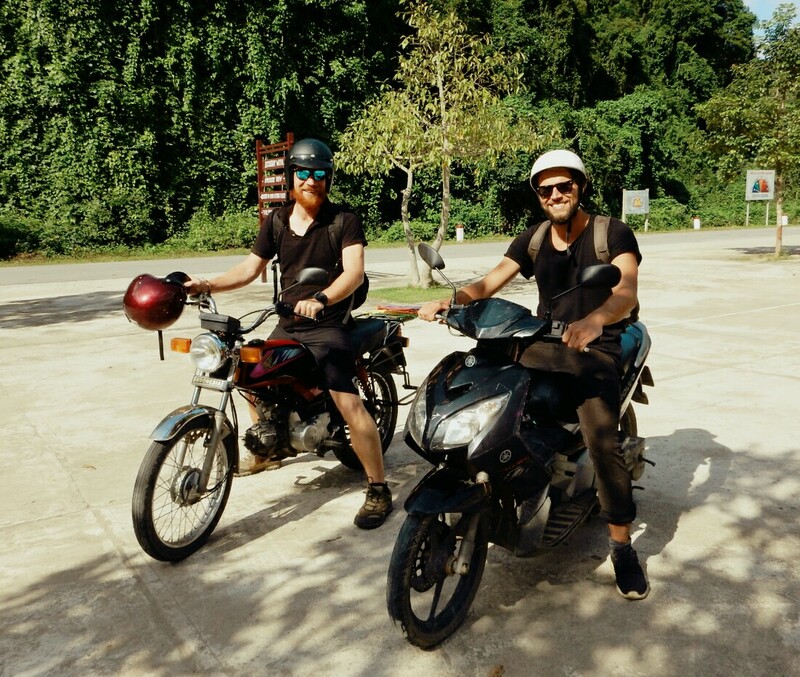 Motorbiking > organized tour buses any and every day! We sped off down the country roads early the next morning, and I could barely wipe the stupid grin off my face as I watched the scenes go by: the lush green countryside dotted with cows, the striking karst mountains wreathed in morning mist, and the friendly locals who smiled at us from their own motorbikes. I had heard a lot of talk about Paradise Cave, so my expectations were pretty high. I had also been told that it is important to get there as early as possible, before the tourist crowds (the same crowd I would have been a part of, had fate and my new friend not smiled on me). Our timing was immpeccable. We were the first to enter, followed soon after by a solo traveler with similar aspirations for solitary sightseeing! The three of us shared some smug appreciation of the peace and quiet, which bonded us for the rest of the day, actually. Paradise Cave did not disappoint. It was absolutely incredible! I couldn't believe how big it was...each time I thought it was coming to an end, we would round a corner and there would be more amazing formations! 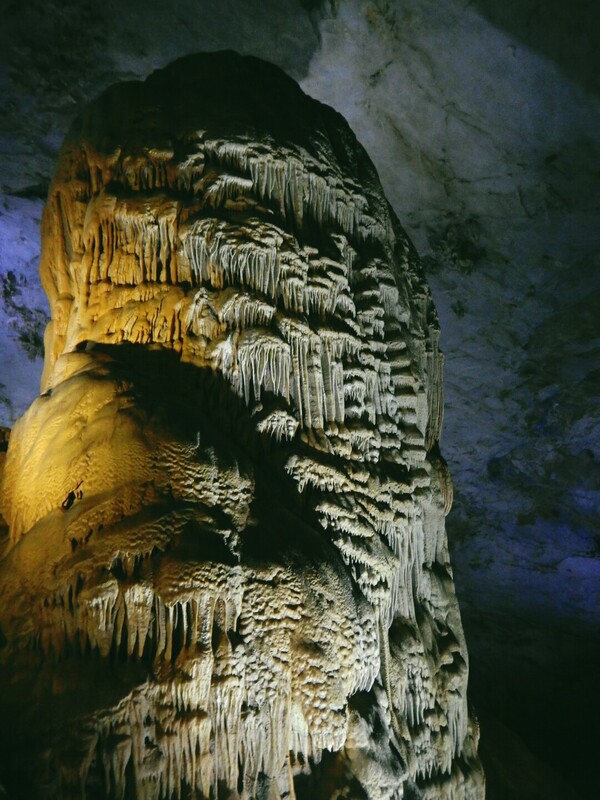 The ceiling soared above us, and the cave actually goes on for 31km, though only about 1 km is open to public viewing, unless you pay for a special tour that will take you further. It is lit with spotlights to show off the best of the stalctites and stalgmites, and little rivers coursing through. My camera doesn't do so well in the dim light, so its difficult to capture the magnitude of the cavern, and my photos don't do it justice. But you can get an idea of some of the cooler formations! It was amazing to be there with no one else around, just taking in the reverent silence and calm. 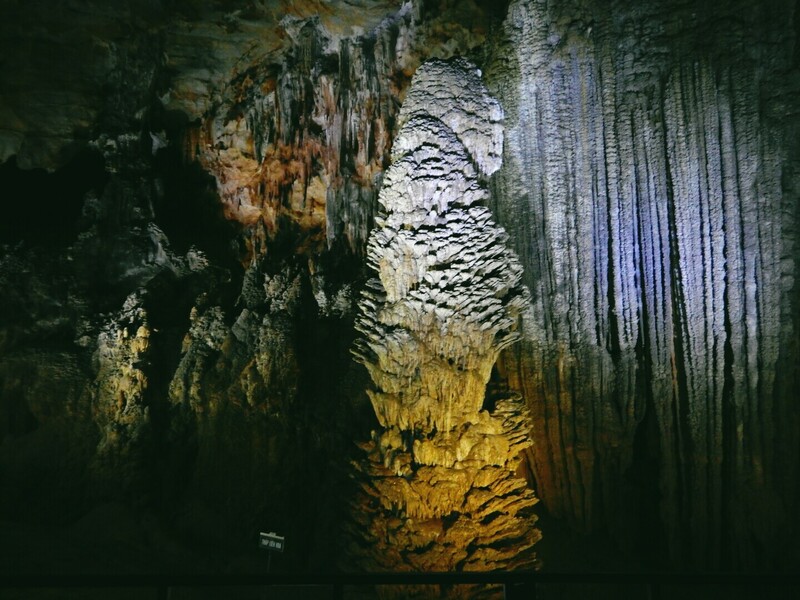 After taking our time, we literally met the swarms of chattering, selfie-stick-happy tourists being herded into the mouth of the cave by their microphone-toting tour guides as we stepped out. We all shared a look of relief, and gratititude for our luck. Next, we hopped back on the bikes and made our way to the much more developed Dark Cave, which involved ziplining across the lake, swimming to the mouth of the cave, scrambling in bare feet through the sliippery mud inside to get to a huge mud bath! It was the trippiest sensation! The mud was thin enough to wade through, but thick enough that it felt like quicksand, and you could easily sit or lay down in it and simply be suspended there! We were in a group of about 10, and it was quite funny to goof around in there- no photos unfortunately, as it was not a safe place for cameras! After our mud bath, there was more swimming in the lake, and finished off with a quick kayak paddle, and a short zipline with a drop into the lake to top it all off. It was all good fun, and after cleaning up we ate a tasty lunch at the restaurant on-site, and then began the drive back to the village. Our final stop of the day was the office to get a ticket to Phong Nha Caves, which can only be reached by hiring a boat to get you there and take you through, since a river runs through the cave. This was highly enjoyable, and felt like a completely different experience from either of the two previous caves. It was also hilarious because our 14-passenger boat carried 11 Vietnamese visitors who were quite entertained by having us three foreigners on board. They asked us a lot of questions in Vietnamese that we simply had no way of understanding, and once we were in the caves it became a full-on photoshoot. I was hugged, my hand was held, and I was required to pose for many, many photos with quite a few different people! The three of us whities were all laughing SO hard because we just felt ridiculous! But I guess we were a real novelty, and they were looking at the photos all the way home, and asking me if I had babies and was married, and if one of the guys was my boyfriend. We were a real source of entertainment! All good things come to an end, however, and after dinner I caught the 12 hour night bus to Hanoi...onwards to the next adventure! But I will always have the fond memories of a great day motorbiking in Phong Nha! Wow, fun times, Jilly! Can't wait to see all the pics you have taken!